It’s a strange thing. The topic of hazardous materials in collections pops up every once in a while but as human beings we tend to forget about it because we consider that – of course – we know these hazards are there, but, then again, we are rather sure we know our own collection well and that if we act according to our safety precautions we are safe. When mercury was found in the air in one of our storage areas during a pollutant analysis, I was shocked and surprised. Of course I knew we had mercury in our collection. We own a considerable number of thermometers and mercury switches. But until this day I considered our handling instructions and other precautions safe enough. This mercury was all contained, right? Yes, it was. But we never had thought of other sources, open sources that were hidden in our collection. 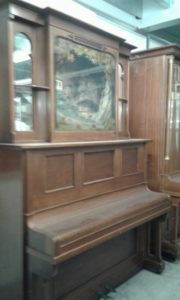 Automatic organ containing open mercury source (sorry for the poor quality of the pcture). As we started to research our objects through the lens of “mercury” we discovered that, in fact, there were a couple of objects we never thought of. 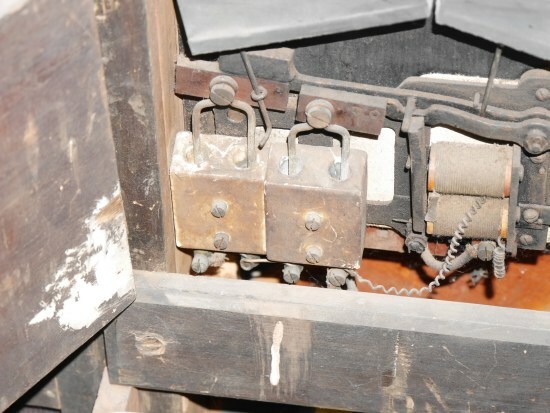 It turned out that there was an automatic organ which operated with contacts that dipped into mercury in some ceramic containers. In our medical history collection we had devices for counting thrombocytes in blood samples that operated with open mercury. However small, given that mercury evaporates at room temperature, even small outlets are an issue! There were barometers and even chronometers with open mercury sources. It was quite an effort to find out which sources we had. Even more to either remove or contain the mercury and seal and label the contaminated objects properly. But maybe the most important lesson was about the importance of good documentation. And we learned it the hard way. Looking back, if someone had thoroughly researched the working principles of said objects, he or she would have discovered that they needed mercury to work. We don’t know if someone knew this when the objects were acquired. At least whoever did it, didn’t mention that they contained mercury in the documentation and the catalog entry. The curator might know best that mercury was necessary to make an object work, but might not be aware that mercury is a problem. The conservator has, due to his or her education, deep knowledge about dangerous substances but not about the object and might not see the object before it is stored if it is in good condition. Even if he or she checks its condition before it goes off to storage, the mercury might be hidden inside, so the conservator isn’t aware of the danger. The collections manager has some knowledge about dangerous substances but not about the object and might not be able to spot the danger if it isn’t widely known to his/her profession (like arsenic in taxidermied specimen is). The database manager has the knowledge about how to make dangerous substances retrievable in the database and maybe even know how to label them properly, but again, as he or she doesn’t have knowledge about the object, he or she doesn’t know there’s a problem. Although all the experts work for the same institution, if they don’t assess the object together and bring their knowledge together, they are likely to overlook a danger and impose a health risk on colleagues, future researchers and visitors. It is also obvious how dangerous it is when whoever is doing the catalog entry doesn’t have indeep knowledge about the objects. There is a tendency in museums to think that cataloging is a task that can be done by “whoever”. Knowledge isn’t important, every intern can key in a short description and some measurements, right? Of course we all know that’s nonsense, but arguing against it is tough. It’s hard to communicate what damage it does if dates, measurements and categorizations aren’t correct. With hazardous materials the danger should be obvious: someone doing the catalog entry who hasn’t enough knowledge to understand the working principles is likely to overlook the danger and therefore imposes a life threat to his or her colleagues and visitors. If the curator can’t do the catalog entry him-/herself for a good reason (And: no, being too lazy/old/busy to learn how to do it isn’t a good reason, at least in my book!) he or she has to share his/her knowledge about the object with whoever does the catalog entry. Objects containing mercury labeled according to international standards. When an object is acquired, consult with everyone involved in the process. All the expert knowledge at one table will help to discover as many potential hazards as possible. If you are a one woman/man museum, make sure to reach out to experts in your area, your regional museum association or international experts via listservs and online groups to learn about the possible dangers your new acquisition contains. If the hazard is new, define safety precautions in handling and storage. If the hazard is long known, make sure your handling and storage precautions are still up to date with current research. In the database: make sure the hazardous material is named. In an ideal setting you do have a thesaurus of dangerous substances to pick from which are linked to safety precautions and correct labeling. In the database: make sure an object that contains dangerous substances is clearly distinguishable from other objects so everybody is aware that there might be special handling and storage precautions. 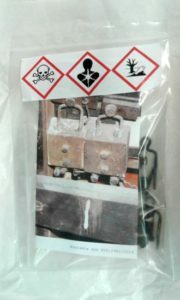 In the storage: label dangerous substances according to international standards. In the storage: store hazardous materials according to the safety precautions. This might involve special containers or rooms with a ventilation system and handling instructions clearly visible on the container. You left out from the list museum managers who are told about the hazards but cant be bothered to inform themselves, too lazy to do anything, pretend an expertise they dont have, think it will be too expensive or will create bad publicity, thereby leaving their collections staff and volunteers at risk. Think that cant happen? Try working for a Local Authority run museum. I know it too good, Bryn, I know it too good. Sometimes a hint that this can become rather expensive if a former staffer, volunteer, visitor or researcher sues the museum can do something to get lazybones-in-chief to do something about it. Also, asking insurance questions can help. A load of information, that hadn’t been thought of before by us. Thank you for this, will be re-thinking cataloguing process. Thanks for the hint, Robert. Indeed this is a huge issue especially for historic houses and castles. I once found a puddle of mercury splashed onto a layer of tissue packing in a crate where it had been left without a lid at the bottom of a shelving unit. It was a completly inexplicable how it had got there or what object it might have come from. This may explain the mysterious source. Thanks for this valuable information. Will keep in mind this info. for my museum. Sounds like you are up and running tackling those collections, Mary. Keep up the good work! Very useful, thank you!!! Sometimes we need written material to prove we don’t ask for fantastic things. Mercuric chloride was also commonly used as a pesticide on botanical specimens in herbaria in the past. Treated sheets were rarely labeled so. Good point, Elana! That’s why one should always assume they are treated unless proven otherwise.